On June 15 and 16, the 6th game of 64th Meijin-sen was held between Meijin Moriuchi and Challenger Tanigawa. Before the game, Moriuchi led the score by 3-2. 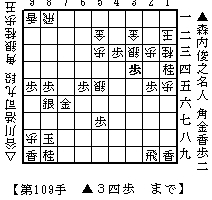 He played Sente(Black, lower side of the diagram) and won it with 109 moves. Moriuchi has been Meijin four times with this victory. If you defends the title next year, he will become the 18th permanent Meijin. Here is the resignation diagram when Moriuchi took a pawn by Px3d and Tanigawa resigned the game. There are no mate for both Kings in the diagram. So it may not be easy to understand why Tanigawa resigned here. Let me try to explain. At the diagram, if Gote's silver on 3c and Gold on 3b are missing, then G*2b will give a mate to Gote's king. This is Sente's basic idea at the diagram. The following variation would be expected after the diagram. There may be more variation, but Sente should win the game in any case. Congratulation on Moriuchi's defending title. He kept all the games in which he was a first player and broke one game in which Challenger played Sente.